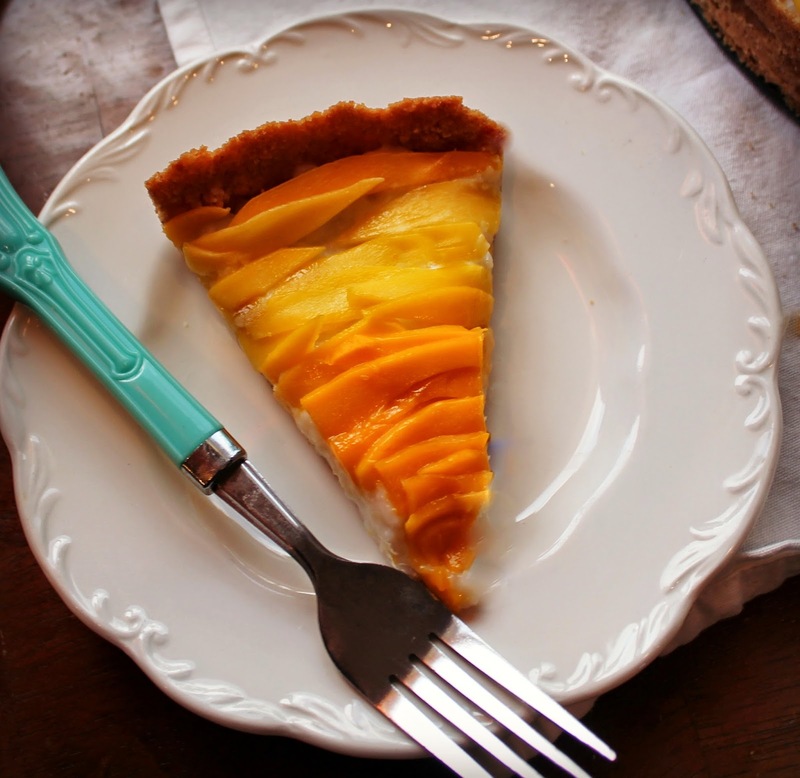 New Wave Domesticity: Mango Sticky Rice Inspired Tart with Coconut & Cashew Crust! 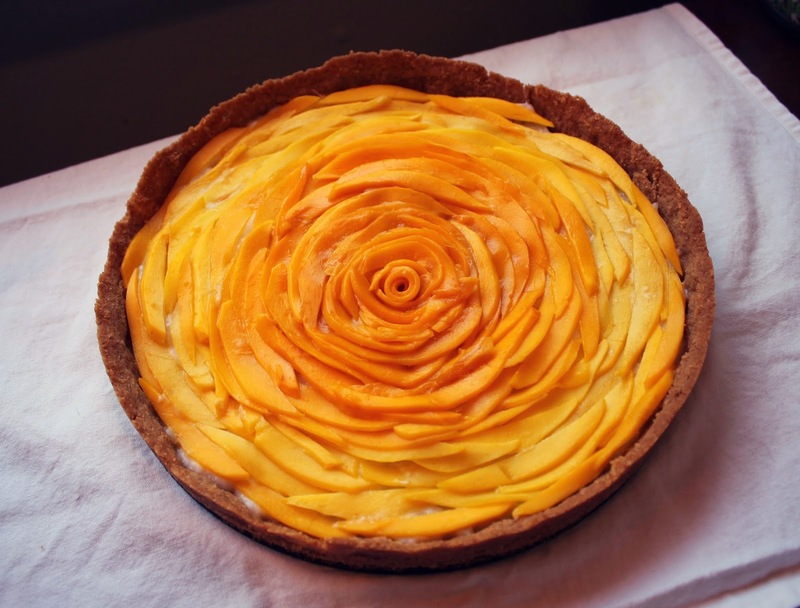 Mango Sticky Rice Inspired Tart with Coconut & Cashew Crust! I love, love, love mango & sticky rice. It is so simple, but it's absolutely my favorite dessert of all time. Something about sweet, fresh, ripe mango with the chewy rice and sublime sweet coconut sauce...it's just such a magical and perfect combination and I can't get enough of it. When in Thailand, my goal was pretty much to order it every single time I could and it was glorious. Once I got home, I had a late night, jet lag fueled stroke of genius - what if I put my perfect dessert into a tart?! YES! So I obsessively write myself a note on my phone to remember when I woke up and I spent a few days thinking about the best way to make my dream a reality. The result was beautiful and amazing. Maybe one of my favorite things I've ever made. I decided to go for a basic cookie crust with an addition of coconut and cashew for a little extra crunch. 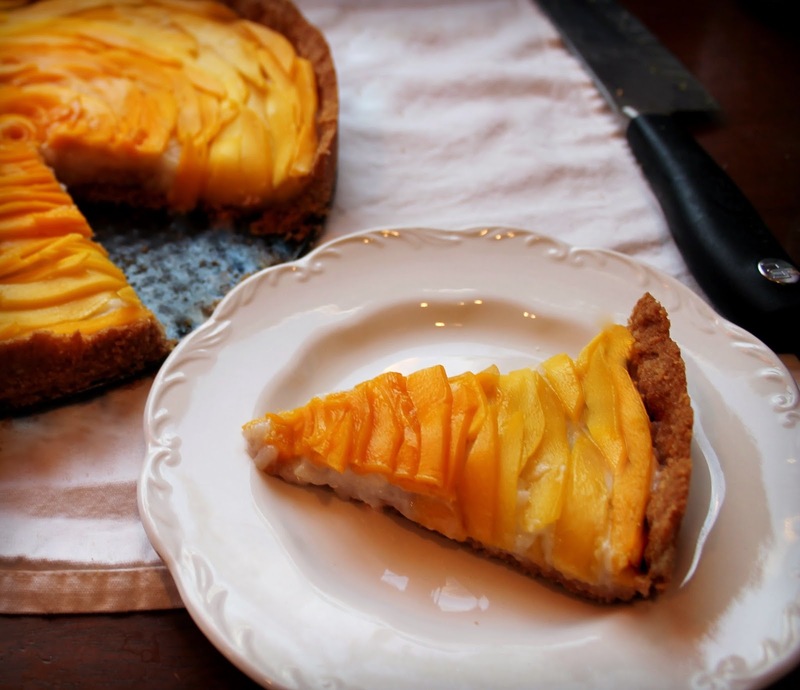 Crunch is the one thing that I thing could elevate the perfect dessert, so this crust was perfect and the flavors match really well without taking anything away from the beauty of the simple mango and coconut flavor combination. The filling is like a nice, thick rice pudding and it doesn't require specially steamed sticky rice to get a nice flavor and texture. It can also very easily be made vegan or not by just using a non-dairy butter in the crust! This tart looks beautiful and impressive, but it's not very hard to make and the parts can be made ahead of a time and assembled before a big event. Preheat the oven to 350 degrees. Combine graham crackers, coconut, & cashews in a food processor. Pulse until ground to a thick powder texture. Add butter and blend until the mixture comes together and starts to stick to the sides. Use your fingers to pinch the mixture and make sure it is sticking together, if not you need to add a bit more butter. Lay the mixture out on a tart pan or springform pan and use your fingers press a thin, even layer along the bottom and sides. Bake the crust for about 15 minutes until browned. Let cool before filling. Whisk together the coconut cream, rice, and sugar. Mix the cornstarch and water well to make a slurry and add. In a large pot, heat over medium high heat for about 10-15 minutes to thicken. Stir constantly. Remove from heat and chill in the fridge for about an hour until fully cooled and thickened. Assemble to tart by spreading the filling over the crust. Cover with the mango and serve. 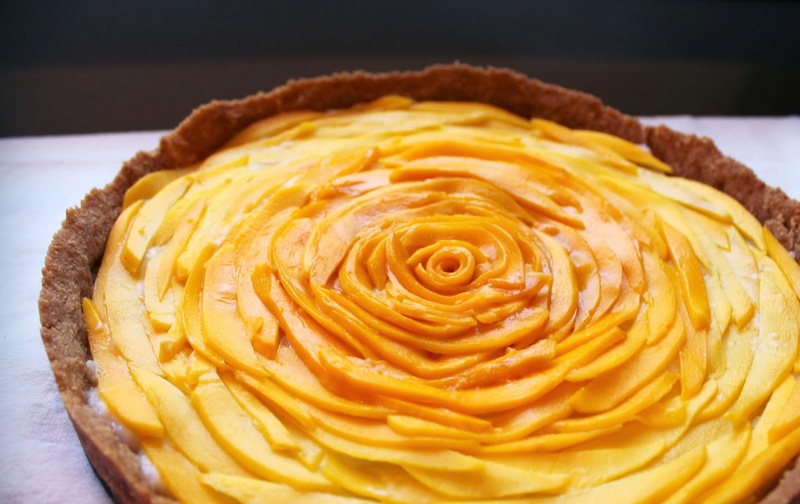 The pretty rose effect is super simple to do, just lay your mango slices in a circular pattern, starting with the outside and working your way inward, layering the previous layer slightly until you get to the center. Cut a few smaller petal shapes for the center circle and finish by rolling up a slice. I used two varieties of mango which is why I have this gradient color and I liked that effect, but you don't need to get all fancy - just use whatever variety is available and ripe. Whether you are a mango sticky rice fanatic like me, or you just want to give it a try - this is a perfect crowd pleaser with beautiful presentation! This is beautiful! I love the rose design on top. So pretty! Looks like you learned something from the photography workshop. :) I love the tagline of your blog - adventures in domestic determination! I would eat the entire thing myself. Seriously. It sounds awesome. Wow, it's beautiful, and it sounds delicious! I love how it looks like a flower. Oh that looks so good! I could definitely use some GF crackers to make the crust. This is just beautiful!! Looks so delicious and makes my mouth water! That looks really good. It's so pretty I would hate to cut it! That is 'almost' too beautiful to eat! It's lovely. Oh This Looks So Yummy & So Pretty Too Thank You For The Recipe!! Never heard or seen it before and what a shame it looks delicious!! thanks for introducing me to new yummy dessert. That is gorgeous! And it sounds delicious! That is so beautiful! I don't think my skills would allow me to make such a pretty dessert. I'd be the Pinterest fail-LOL! Not only does this look delicious and mango is my favorite but it looks like a work of art! Absolutely! Great idea. This could really easily be made gluten-free. That's kind of what I love about this recipe, it's so pretty and yummy but it's made of really simple ingredients that can easily be made for most diet sensitivities! I'm making it tonight again to bring to my canning club so I think I will try the GF crackers just in case! That is absolutely beautiful! I can hardly believe it! That is one of the prettiest dishes I have ever seen. I'd hate to cut into it! Wow, this looks great but I've never tried anything like it - I'd LOVE to see what it tastes like! Oh my gosh that looks amazing! And such beautiful tastes - coconut and mango are the best! Wow! I seriously want to try this! Mango and rice! I can't even think about what this could taste like! That looks beautiful and very yummy! I love it! Wow, that looks amazing! I love both mango and coconut.